What's the Best Way to Maintain A Consistent Angle While Sharpening? Other than constant practice, how do you maintain a consistent angle while sharpening a knife or tool? 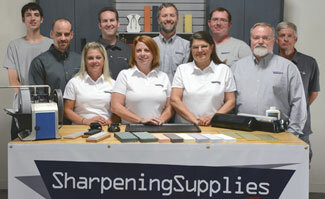 Almost daily, sharpeners ask us what they can do to keep their knife or tool at a constant angle as they sharpen it. This is probably the most common source of frustration for sharpeners. It’s an understandable concern, the inability to keep the angle steady wastes time sharpening the wrong part of the bevel, changes the shape of the blade in unwanted ways, and most importantly, doesn’t result in sharp edges. It is possible to sharpen effectively, people have been doing it for a long time. So how does one keep from changing the angle during sharpening? This article looks at some effective ways of maintaining the angle when sharpening. Don’t worry, we’re not going to tell you that powered sharpening is the only way to keep a steady angle. However, it is worth mentioning here as one of the biggest benefits of powered sharpening systems like Work Sharp and Tormek are the guides that they offer. These systems allow many edge shapes to be sharpened accurately and repeatedly. While these systems can’t do everything and aren’t for everyone, they are worth considering for their accuracy. Of course, sharpening has been done by hand since long before the powered systems existed, and it can still be done this way. Yes, it does take some practice, but it is achievable. Let’s look first at sharpening freehand, with no guides. We find that hand sharpening can broadly be broken down into knife sharpening and chisel or plane blade sharpening. The basic procedure for both is similar, but there are differences in how you hold and move the blade being sharpened. 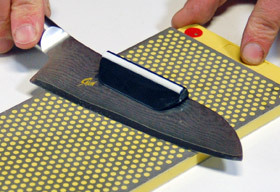 There are different techniques for moving a knife blade across a sharpening stone. Some sharpeners favor a heel to tip sliding action. While not as common, a few sharpeners employ a tip to heel motion. Others use a figure eight or circular pattern. If the angle is kept steady, any of the techniques can be used successfully. Below, we describe a heel to tip motion as it is one of the most common. Start by placing the heel of the knife on the stone at your desired angle. 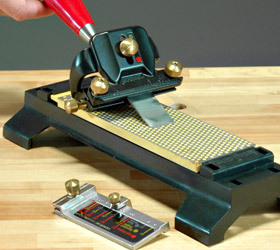 For help deciding which angle to use, see our article: Detailed Discussion on Knife Sharpening Angles. Then slide the knife blade along the length of the sharpening stone. As you move the blade from one end of the stone to the other, you will also be drawing the blade from its heel to its tip so that the entire length of the edge makes contact with the stone at some point during the stroke. If the knife has a perfectly straight blade, you can keep your hand and wrist steady as you complete the motion. A straight bladed knife will typically start out 90° to the length of the stone and remain that way throughout the stroke. However most knives have some curvature to the blade, especially at or near the tip. As the blade curves, if the motion is kept the same the effective angle at which the edge meets the stone changes, lowering the angle of the bevel. This is a common problem and results in the tip of the knife being sharpened ineffectively or not at all. In order to maintain the bevel angle on a curved blade, you must alter the position of the knife relative to the stone while making the stroke. A good method for following the curve is to rotate the knife lengthwise in relation to the stone as you move through the stroke. As you progress through the curve, concentrate on the point of contact between the blade and the stone. The edge of the blade at this point should be perpendicular to the length of the stone. As you rotate the knife, the handle will lift in a smooth arc, following the plane of the sharpening angle. The degree of the blade’s curve determines the amount of rotation required. From a starting point 90° to the length of the stone, a blade with a slight curve will rotate only a few degrees, but a sharply curving blade may be close to parallel with the stone by the end of the stroke. Hold the tool with two hands, keeping your grip as close to the stone as possible. On wider blades, spread your fingers as much as possible to create even downward pressure across the entire blade width. Then place the bevel of the tool on the stone and move the tool across the stone. Lock your wrists and use your body to move the tool. Try moving your whole body instead of just your arms.This will keep the blade more stable. As with knife sharpening, bending the wrists as you move the blade will rock the blade. As with knife sharpening, some people are able to use back and forth, circular or figure eight motions. However, when changing direction, it is easy to rock the tool, altering the angle. If you find it more comfortable to move the tool along the stone in a single direction, either towards or away from the edge, then do so. At the end of the stroke, lift the blade completely off the stone and return to the original starting position. If freehand sharpening is causing you frustration, consider a sharpening guide. There is no shame in using guides when sharpening. They are tools like any other, and when used properly, guides are time savers offering accuracy and repeatability. The variety of guides available for sharpening by hand can be broken down into guides for knives, and guides for chisels and plane blades. Guides for sharpening knives come in two forms. There are systems that hold the knife while a small stone is moved over the blade, and guides that hold the knife as the blade is moved over a larger bench stone. Guides that hold the knife while a smaller stone is moved over the blade are available from DMT, Lansky and Gatco. All three models have a clamp that holds the blade combined with small sharpening stones attached to arms. These arms slide through guide holes in legs on the clamp. The arms are adjustable in predetermined steps to allow sharpening at different angles. The clamp with adjustable arms component of the DMT Aligner guided sharpening system can be used on its own to guide knives on bench stones. With seven position settings, a great range of angles can be achieved. 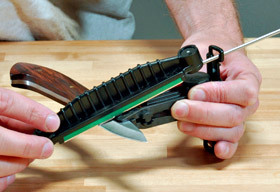 Once clamped on the spine of the blade, the sharpening techniques is same as when sharpening freehand, keeping the leg of the guide on the work surface. 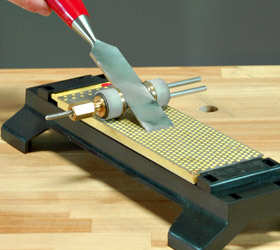 For step by step instruction see our article Using the DMT Knife Sharpening Guide. This guide is another that allows the knife to be moved over a bench stone, and it is the easiest to use of any of the knife sharpening guides. However, it is non-adjustable. The bevel angle achieved is determined by the width of the knife blade. As such, it is not for use with every knife. This guide works best with traditional kitchen cutlery having blades wider than 3/4”. For instance, a knife with a 1 1/8” wide blade will sharpen to an angle of 20 degrees with the Naniwa Guide. Simply clip the guide over the spine of the knife. Then lay the knife on the stone and use the same technique as freehand sharpening, but keep the guide in contact with the stone at all times. Some sharpeners affectionately call these “training wheels for your tools.” Whatever the name, they work. Chisel and plane blade guides allow you to maintain angle, make it easy to hold blades that can be tricky to hang onto otherwise and make it easy to get an edge that is square to the shank of the tool. They also allow for back and forth movement on the stone with no rocking, speeding up sharpening time. 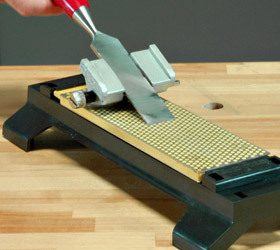 This is the most versatile of the sharpening guides for chisels and plane blades. It has multiple setting for micro bevels as well as a registration jig that centers and squares the blade while determining the correct projection for the desired sharpening angle. An accessory Cambering Roller Assembly allows edges to be sharpened in a cambered, or rounded, shape. And an accessory Skew Registration Jig accommodates skew ended chisels and plane blades. This beautifully made guide is a pleasure to use. It has a smooth action and a positive grip on the blade. The Kell Guide makes keeping a dead straight edge that is square to the tool shank easy, and in fact it is not possible to produce a cambered edge with this guide. This honing guide doesn’t have a fancy name like the others, but it is effective none the less. A great value, it has two clamping positions to accommodate narrow or wide blades. The wheel of this guide is relatively narrow and with wider blades some care must be taken to prevent side to side rocking. This can be an advantage however as rocking can be deliberately done in a controlled fashion to produce a camber on the blade’s edge. Keeping a knife or tool at a consistent angle is probably the biggest challenge sharpeners face in their quest for a truly sharp edge. But it is a problem that can be dealt with. 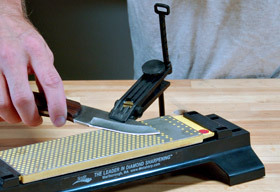 Whether freehand or with a guide, it is possible to maintain an angle while sharpening. Questions about keeping your angle while you sharpen?